When I say 'Machine Guns', you say 'Turn-Based'! By most accounts, the 80s were the cinematic peak of character action movies. You had your John Rambos and your John McClanes turning bad guys into piles of far-less-alive bad guys. You had your Terminators and your Predators providing hours of evidence that Arnold Schwarzenegger is indestructible. Those movies are thoroughly fake, of course (everyone knows Schwarzenegger's weakness is [REDACTED]), but within every lie is an inkling of truth. That's why Tango Fiesta aims to tell the real story on September 24th. 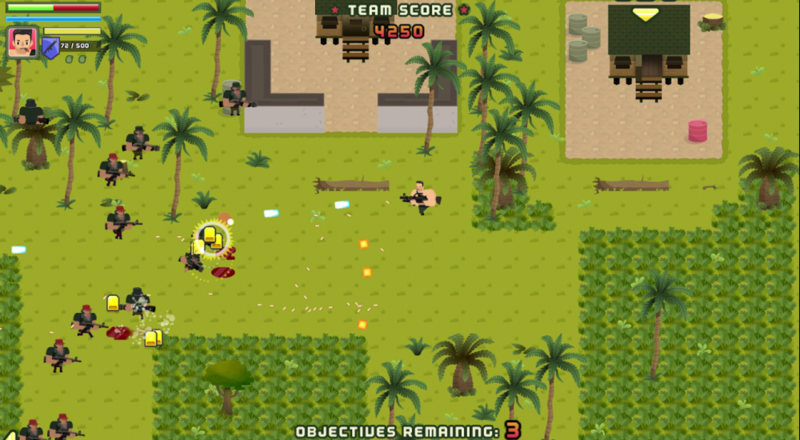 At its core, Tango Fiesta is an arcade action shooter in which you and three friends relive the tale of John Strong (and his presumably much less important cohorts) as he takes on foes ranging from aliens to game show hosts. Check out the release date trailer for a glimpse at what exactly Strong's story entails. The folks over at Spilt Milk Studios weren't quite satisfied with their game being heralded by a just boring ol' trailer, though. They simultaneously released a free JRPG on Steam (the appropriately titled Legend of Tango JRPG) that details the entire development process from Game Jam to launch date. That game, too, has a launch trailer, but that is unfortunately as deep as the rabbit hole goes. Regardless of the meta-prequel's quality, that's certainly one of the most unique PR moves I've ever seen. Tango Fiesta will offer both online and local co-op for four players. Here's hoping that truth really is better than fiction. Page created in 1.3394 seconds.